So opulent and ever the attention-grabber is the Gloriole Ring. 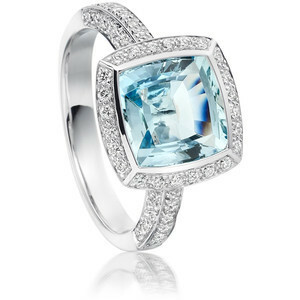 The showstopper features a large square cut aquamarine diamond surrounded by white diamonds, with white diamonds also lining the shoulder of the band. You'll feel like a star with this creation from Astley Clarke's Couture line! Try it on, with ViewTry!